The Barometer profile shows the current sea level air pressure. This is based on the reference values added in the settings and the constantly measured absolute air pressure. For information on setting the reference values, see Setting reference values. Changes in the sea level air pressure are presented graphically in the middle row of the display. 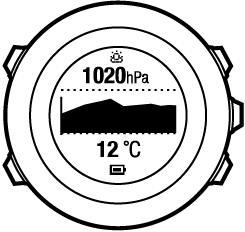 When the Barometer profile is activated, the barometer icon is shown on the display. For information on setting the Alti & Baro profile, see Setting profiles. the latest altitude logged in the Automatic profile before changing to the Barometer profile.